Along Napa Valley’s Highway 29, are many large, clearly signposted tasting rooms; Gamble Family Vineyards is not one of these. The tasting room is not visible from the road, nor is there a sign with the Gamble name. The house number is on a small sign at the top of the track that leads down to the winery. The sign is easy to miss; we did on our visit to Gamble. This anonymity is deliberate; tasting is by appointment only. On this tasting, we were joined by fellow wine writers Rick and Gary from Strong Coffee to Red Wine. 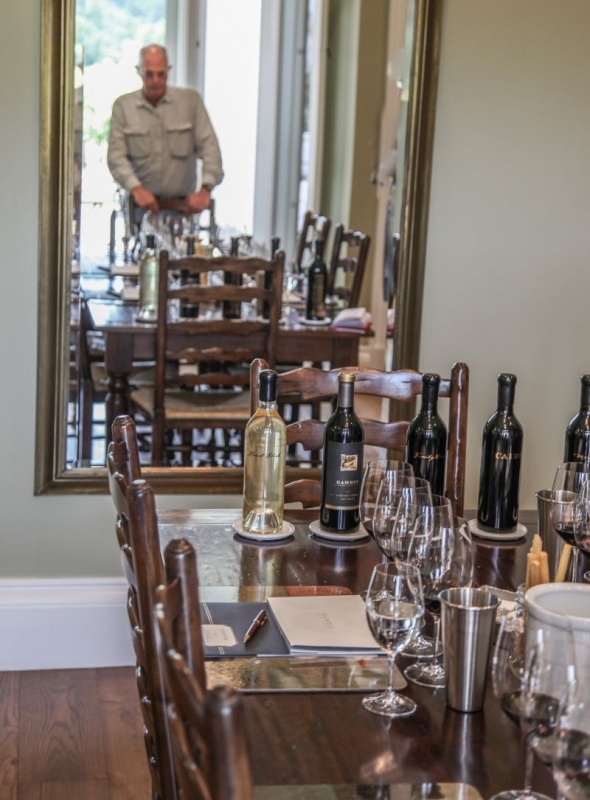 Tom Gamble, the winery’s owner, is a third generation member of his family to farm in Napa Valley. Tom purchased his first vineyard in 1981; growing grapes for others to make wine. 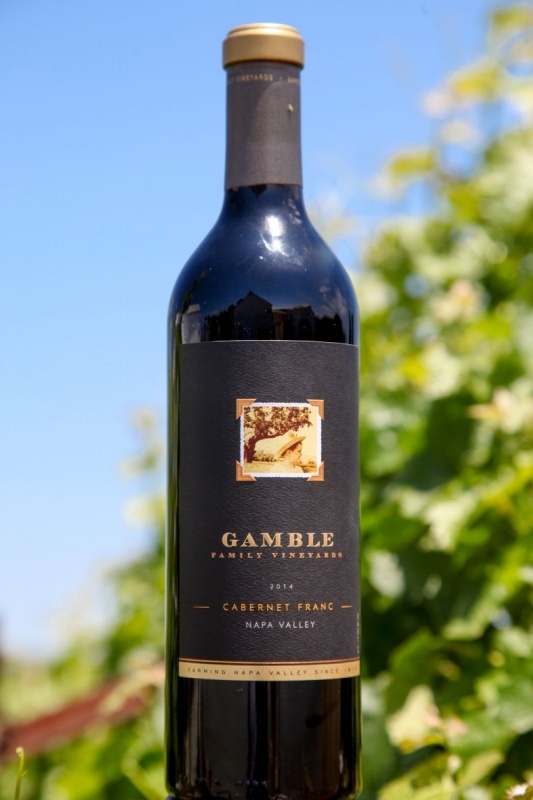 It was nearly quarter of a century later that he started making his own wine; the first vintage from Gamble Family was 2005. The property on which the winery sits is adjacent to the farm on which he grew up. 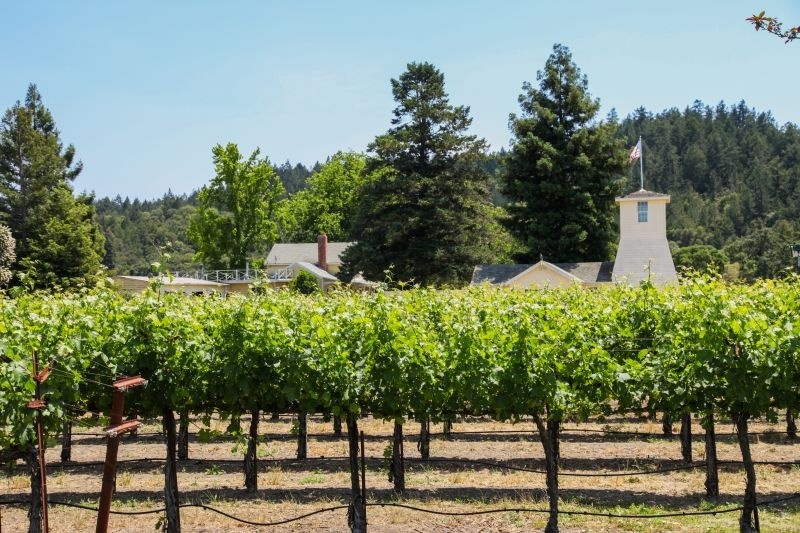 He now has several vineyards on the valley floor between Yountville and Rutherford and a small plot on Mount Veeder that grows Cabernet Franc and Merlot. Gamble Family have had the same winemaker from that very first vintage; an Englishman by the name of Jim Close. We were met by Melissa who poured us a taste of The Heart Block Sauvignon Blanc which we enjoyed on the patio whilst waiting for Tom. This wine sells for $90. It spends eighteen months in French oak. The nose was surprisingly complex for a Sauvignon Blanc; vanilla, lemon, and peach combine to create a lush and inviting first impression. The flavour leads with a distinct acidity from flavours of lemon and green apple. The finish is long and softens with a delightful creaminess. This wine is very different from most Napa Sauvignon Blanc; closer in style and lushness to an example of the varietal from the Loire Valley. 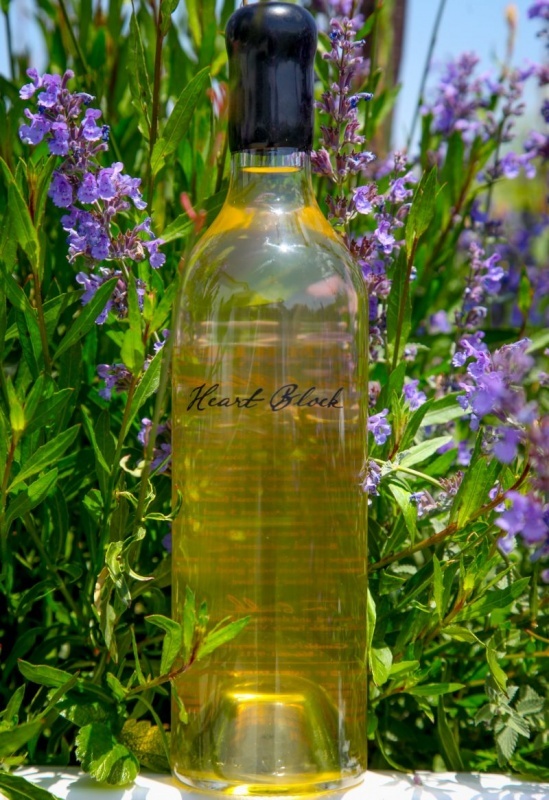 The Heart Block is, as the name suggests, at the centre of its vineyard; the Gamble Vineyard, which in turn is pretty much in the middle of Napa Valley. Tom took us on a short tour of the winery. 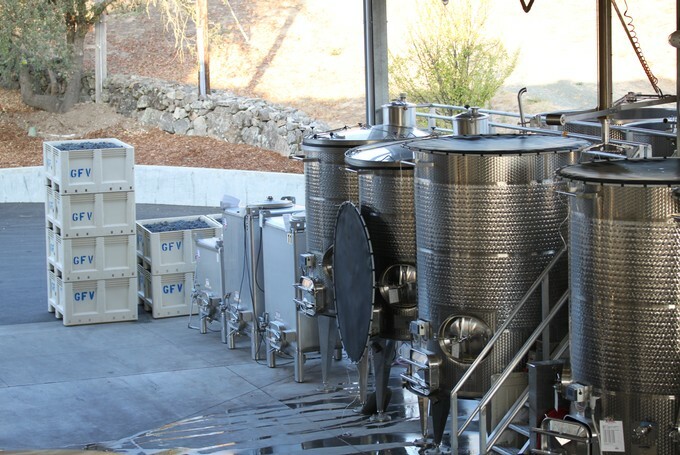 The tank room is open on three sides; which makes it easier to bring trucks full of grapes into the space. He showed us the barrel rooms, each of which was full of closely packed racks that were stacked to the ceiling with barrels. Each room is its own temperature controlled zone. His brother-in-law was the architect. Fifty percent of the electricity used by the winery is from alternative sources. Amber comments: What struck me about the property and the man himself is that they both had a classic farm feeling with a completely modern edge. You can see this in the architecture of the building, the technology that they use in it, and you can hear it when Tom speaks. I could picture him as the poster child in a magazine called Modern American Farmer. After the tour, we sat around a table with Tom and tried some of the red wines from Gamble Family. We started with the Cabernet Franc. The grapes for this wine are sourced from the Varozza vineyard. The nose is of plum, cassis, and earthy notes. The wine is subtle, with a medium plus body. Acid was to the fore. The raspberry fruit flavours were restrained. Notes of cumin added to this fascinating wine that sells for $90. Amber comments: I think the Cab Franc was my favorite tasting of the day. It was complex and a perfect pairing for food. Lamb chops wafted through my mind as I savored each sip. I loved how this wine really showed off the grape from which it was made. The second red was Family Home Cabernet Sauvignon ($110). The fruit for this wine is grown in volcanic soil that bakes in the summer sun, enhancing the concentration of the juice. The intense nose offers aromas of plum, cassis, and damp loam. The taste is mouth-watering cherry, raspberry, with a mineral backbone and floral swirls. The tannins are understated. Amber comments: As I was drinking this one around the big farmhouse table, I could imagine Sunday lunches with family and friends, enjoying roast beef and all of the trimmings. Mmm Perfection! Next up was the $130 Cairo. The wine and the vineyard from which the fruits comes are named for Tom’s late dog, whose name was inspired by pointed ears reminiscent of Egyptian sculpture. The winery is topped by wind vane with Cairo’s silhouette. This Cabernet Sauvignon had a nose of cocoa, plum, and cigar box. The flavours were bright with raspberry, blackberry, and cocoa. We could not reach a consensus as to which of these two Cabs we preferred. We did agree that they were both excellent wines. Amber comments: This would be a great wine with a big juicy steak that doesn’t need any fancy treatment. Serve it simply with baked potato and grilled corn on the cob. Having said that, don’t get the impression of this wine being “That Napa Cab” – meaning all tannins and you cant drink it for at least 10 years. This wine can be enjoyed now or laid down to age for many years to come. Next was Mary Ann ($165). The wine is named for Tom’s mother. 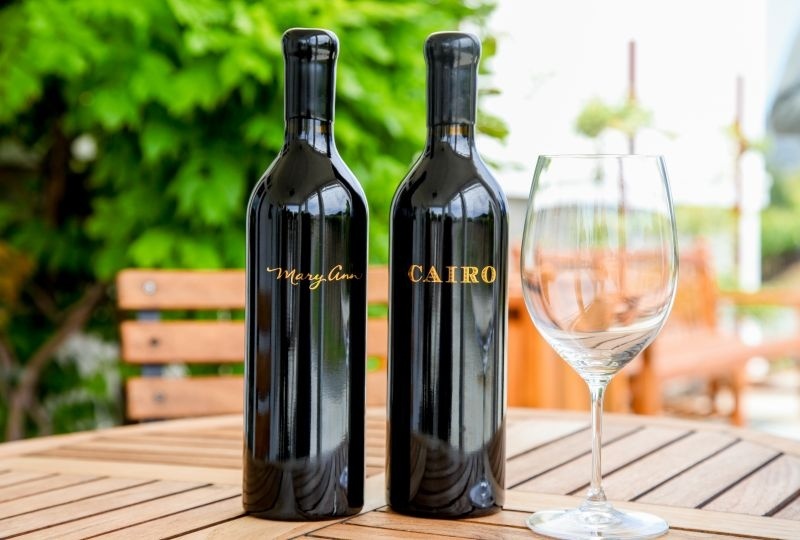 To quote their website: “a blend inspired by elegance, opulence and firm character.” The blend is of Cabernet Franc and Merlot from Mount Veeder. The nose was intensely fruit driven; plum and raspberry with a sprinkle of pepper. A medium bodied wine with flavours of plum and raspberry balanced by assertive dusty tannins and distinct acidity. In a long finish, black tea and blackberry emerge. Whilst the wine is thoroughly enjoyable now, the tannins and acid suggest it has the potential to age well. Amber comments: The Mary Ann is a classic that will age gracefully. I’d love to give this wine at least 5 years in the cellar so it can release some of the hard edges of youth and gain the grace that is there waiting to shine. We finished with Paramount; a blend of Cabernet Sauvignon, Cabernet Franc, Merlot, and a small amount of Petit Verdot. The wines are aged separately in Fench oak barrels for twenty months. The bouquet was intense: sour cherry, raspberry, and decaying wood. The wine had a soft, silky mouthfeel. Starting with redcurrant, plum, and raspberry the long finish had underplayed earthy tannins. This wine was a delight and we took a bottle home with us. Amber comments: I am a blend lover, and I really loved this sip. This, of course, could be consumed with any wonderful meat dish you throw at it, but I kept thinking of this wine as the romantic fireplace and cheese pairing. Tom was a charming host; a farmer with a love of the land and of wine. All of the wines were excellent. 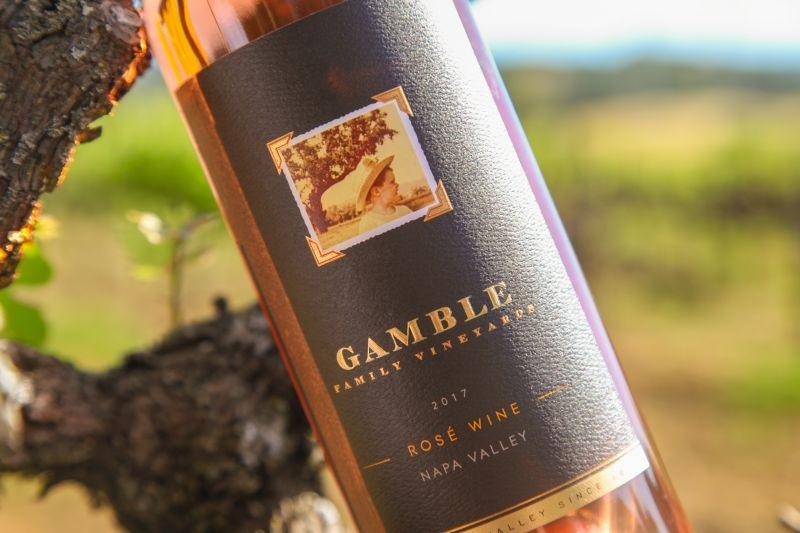 Before visiting Gamble Family, the only wine I had tried was their rosé; made from the same grape varieties as go into the Paramount blend. A robust rosé; a red wine drinkers rosé. 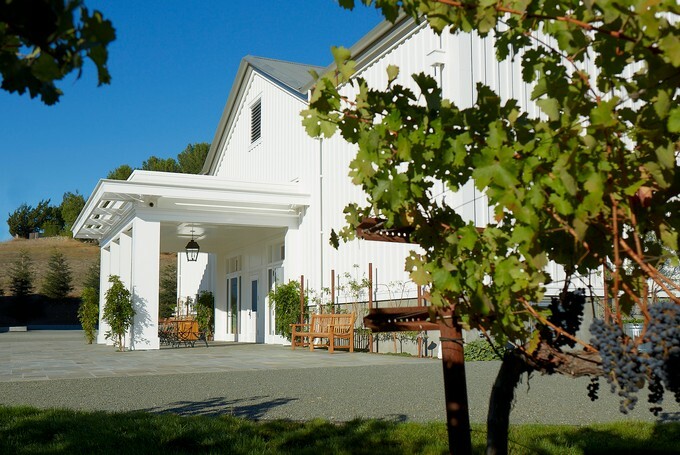 If you want to try something different from the large well-known wineries on Highway 29, Gamble Family are well worth contacting for an appointment. Great article! Why after so many years did Tom decide to finally make wine? And I’m curious about their alternative power sources. Plus now I want to try the wine! Cheers. Hi Allison, I think Tom felt like he had his own vision for the wine that he wanted to express. Also, I know he uses solar power, and his winery is super high tech and energy efficient. He even stacks his barrels vertically to maximize space and efficiency. I’d highly recommend you visit. Sounds like an interesting visit. Cheers, guys!